The Americans with Disability Act of 2010 clearly defines the basic parking space requirements of a building which are used to determine its compliance. It contains all the various requirement at federal, state and local levels. It is aimed at ensuring parking spaces are usable by disabled people. ​Under the ADA, requirements dictate the minimum number of handicap accessible parking spaces for buildings and facilities. It outlines specifically the necessary requirements for parking spaces that will allow people with disabilities to easily access the buildings. New buildings being constructed must meet this requirement while older properties are required to make all possible alteration to meet this requirement. The parking spaces must be connecting to the possible shortest route to the entrance of the building or facility. If the business has several entrances the accessible parking spaces must be evenly distributed. Public buildings must also remove the barrier of structural nature that is likely to inconvenience disabled visitors. The parking space should not be just a place labeled as parking space for the disabled. The ADA parking space requirements state that the access aisle to be at least eight feet wide to accommodate the wheelchair lift that is mounted on one side of the van. This is three feet more than a regular parking space. A vehicular clearance route of at least 98 inches is also required. Another alternative is minimum 8 feet wide for accessible space and 11 feet wide for van accessible space. This alternative must also have 98 inches vertical clearance. These spaces enable individuals to deploy vehicle mounted with wheelchair lifts and use wheelchairs and walkers. The parking space should also level with a maximum slope of 1.5. The accessible parking must be clearly shown using the properly approved sign. 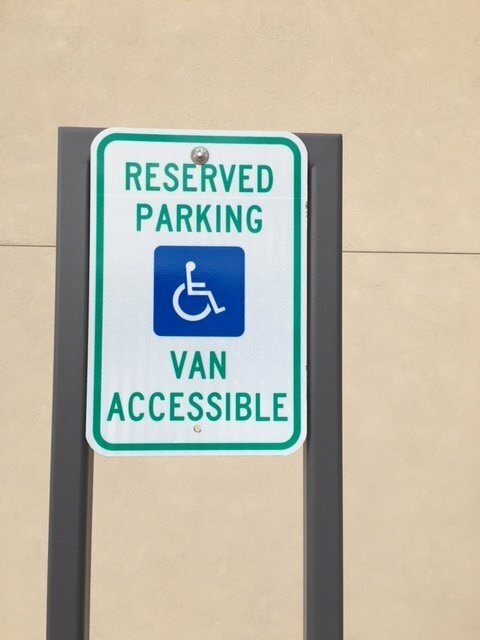 The sign used in van accessible space should also include the phrase 'Van-Accessible'. The sign should be made easily visible once it is installed. The sign should be mounted such that the lower edge is at least five from the ground. The height also enables it to be visible to law enforcement. Our crews are able to install all metal signage, to keep your parking lot compliant. The ADA parking space requirements have been put in place not to increase regulation on businesses but rather advocate for the needs of the disabled and make them feel respected and appreciated. ​Call today for a free quote for your next project. 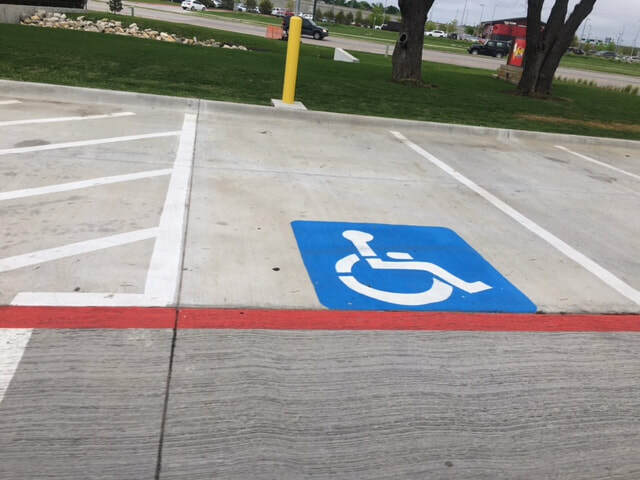 We are ready to provide you with a free quote for all line striping, fire lane striping, concrete wheel stop installation, and metal signage installs. If your business happens to be outside one of these areas, please contact us, we would still be glad to assist you.